I miss Mama. "Mama" is my maternal grandmother and I spent a lot of time with her growing up because she lived with us on and off. I would pretend to (un)braid her hair and we could talk about nothing for hours. She passed away in April of 2010. Every so often, I think of something that reminds me of her and I miss her. Mama was a huge proponent of traditional remedies, from agbo (tastes like death) to using efirin in everything (smells and tastes great). But the one thing she used on a daily basis was her pako a.k.a. a chewing stick. I don't think I ever saw her use a toothbrush, and she had a full set of pearly whites her whole life! Once used by the Babylonians (3500 B.C. ), Egyptians, Greeks, and Romans, the chewing stick of old was simply a small wood "toothbrush" used in our predecessors' daily oral hygiene. Although Europeans once took advantage of this simple method, the chewing stick fell out of favor with them over three hundred years ago. 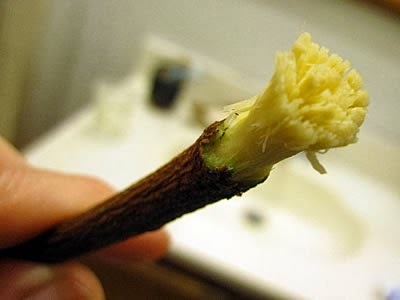 Although the most common source of the chewing stick is the saltbush (also called toothbrush tree) in the Middle East, in West Africa, orange and lime trees are used, while the neem tree (neems) is the main source for chewing sticks in the Indian subcontinent. Astonishingly, nearly three hundred different species of trees and shrubs in East Africa are used in making chewing sticks! Chew sticks are usually nothing fancy--they are simply made out of frayed twigs. 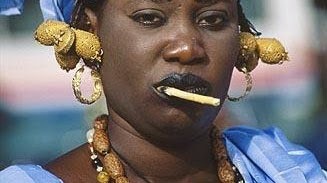 Through Africa or Asia, you may come across people casually chewing on a stick much like people may have a toothpick in their mouth. 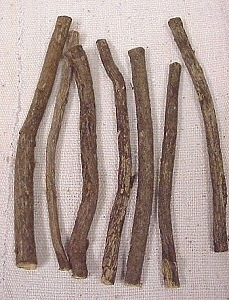 The twigs are generally cut to a thickness of a pencil; and are chewed until the end of the stick frays. The frayed end works like dental floss cleaning in between teeth keeping teeth and gums healthy. Once the end of a chew stick is frayed it can be rubbed on teeth, much like using a toothbrush, scrubbing food and plaque off teeth. Chew sticks are much less expensive than traditional western toothbrushes making them much more accessible. Olive, Walnut, and other trees with bitter roots. Curious to try it out? 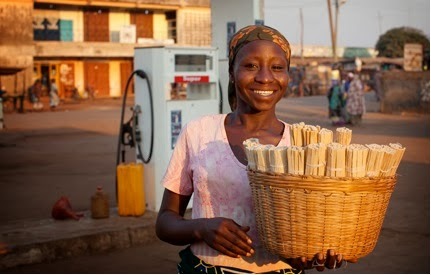 Africa Imports has a selection of chew sticks with a range of colors and flavors. She's wondering why you aren't chewing on a chewing stick. Side note: My locs are in! I'll make a post about the experience after having them in for a few more weeks. I'm so tempted to give this a try! You're quite right about the pearly whites too! People who I noticed using them always seemed to have great teeth.